Thomas the Tank Engine is getting an overhaul and in some new episodes the show’s long running gender imbalance will be addressed. New episodes introduce new characters, including a whole lot of female characters, and they’re bringing a multi-cultural international flavour to the show too. Thomas and Friends: Big World! Big Adventures! will air in the UK next week. Joining the crew will be Ilsa from Australia – who is a Royal Flying Doctor’s plane – Hong-mei from China, Nia from Africa and Churubala, a female railway controller from India. The decision to give Thomas some new female friends, and to let those female characters be proactive and do things, has got one conservative commentator all worked up. 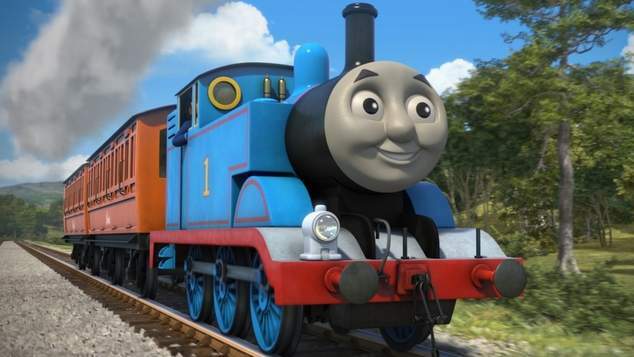 This morning the Australian Catholic University’s Dr Kevin Donnelly published an opinion piece in The Australian titled Thomas the Tank Engine Gets Shunted Down the Left Track and yesterday he took to the airwaves to decry that once again it was politically correct madness taking over. Thomas and Friends was created by the Reverend Wilbert Awdry, who first came up with the characters to amuse his son Christopher when he had the measles. In 1946 he published a series of books featuring various steam engine characters, Thomas was not initially envisaged as the star of the series, he turns up in the second book. Christoper Awdry wrote some more stories about Thomas in the 1970’s and it was then turned into the popular children’s television show that has become a worldwide phenomenon in the mid-1980’s. The show has always been criticised for having poor female characters. Its not that they don’t have any – it’s more that they don’t get to do anything, except get in trouble and be saved by Thomas, Percy, Henry, Edward, Gordon, James or Toby. Appearing on Adelaide radio station 5AA Donnelly bemoaned that Thomas was joining the long list of children’s books that had been deemed politically incorrect. Donnelly said it was terrible that parent’s were discouraged from reading their children stories like Cinderella; because marriage should not be a woman’s final goal, and Little Black Sambo which has been deemed to have a racist perspective. “You can’t read that, because like golliwogs, it’s going to offend people of colour.” Donnelly lamented. “You really have the politically correct though police going through a lot of children’s literature and making sure it conforms to what now they argue is politically correct, and really they are rewriting history which I don’t like.” he said. Donnelly went on to say that a Melbourne school had changed the words to the song Kookaburra sits in the old gum tree removing the line “how gay your life must be” because it was deemed to be offensive to the LGBTIQ community. Keith, a caller to the station, joined the conversation and said that political correctness was also demanding people stop using the phrase “fairy tales”, because the LGBTI community was taking offence. Donnelly said the impact of political correctness was becoming a serious issue in Australia, and his concerns had been growing since he conducted a review of the school’s curriculum for the federal government. “It is getting serious now, what we’re teaching in the classrooms and what we’re teaching in University.” he said. The academic complains that political correctness is embedding a culture of “victim-hood” into popular children’s series but really it is removing it. Pretty much all that ever happens to the female characters in The Lion, the Witch and the Wardrobe, or The Magic Faraway Tree or Thomas the Tank Engine is they get themselves in trouble and wait for a man to come along and sort it out. What message is that giving to the nation’s daughters? In the film adaptation of Lord of the Rings one of the memorable scenes is when Frodo is rescued by Arwen, played by Liv Tyler. Arwen summons a flood and saves Frodo from the black riders. That didn’t happen in J.R.R. Tolkien’s book though, in the novel Arwen stayed at home and it was her father Elrond who summoned the flood and Glorfindel who takes Frodo to the safety of Rivendell. Was the story lesser or better for the change? We change stories all the time to reflect the world around us, TV’s Elementary re-imagines Sherlock Holmes as being set in New York in the present day and Holmes sidekick John Watson has been replaced by Lucy Liu as Joan Watson. Baz Luhrmann brilliantly retold Shakespeare’s Romeo and Juliet as a mafia family drama. The Bell Shakespeare Company once delivered a season of Macbeth that was set in space, locally we’ve even seen R&J a queer retelling of Romeo and Juliet that saw Juliet replaced by Jules – turning it into a gay love story. The essence of the story is the same, but it reaches a new audience. You’d be hard pressed not to see the linkage between children’s stories lacking female characters, or only having female characters in passive roles, and the statistics on women’s career choices, and salary rates. Sure we can write new stories that have women taking action and being front and centre like The Hunger Games, but it’s fair game to take the stories we love and update them for the world we live in – and the one we aspire to. So bring on Jane Bond, let Noddy have more adventures with Tessy Bear rather than always hanging out with Big Ears, find some female character to join Winnie the Pooh beyond the matronly Kanga, embrace Jody Whittaker as the lead in Doctor Who, let’s remake Battle of the Planets and add more than one girl and let’s change her name from Princess to an actual name, celebrate that Zoe, Rosita, Abbey Cadabby and Julia finally showed up to keep Prairie Dawn company. Also – I don’t think we have any problem with Kookaburra’s feeling gay or fairy tales.